I’ve been sitting on this recipe for awhile because I failed the first time I made it. It was totally my fault too! I dumped a heaping 1/4 cup of pine nuts in the pan and didn’t bother tasting them for freshness. Turns out they weren’t and my family & I had to suffer through it. Everyone kept reassuring me it was fine. IT WAS NOT. 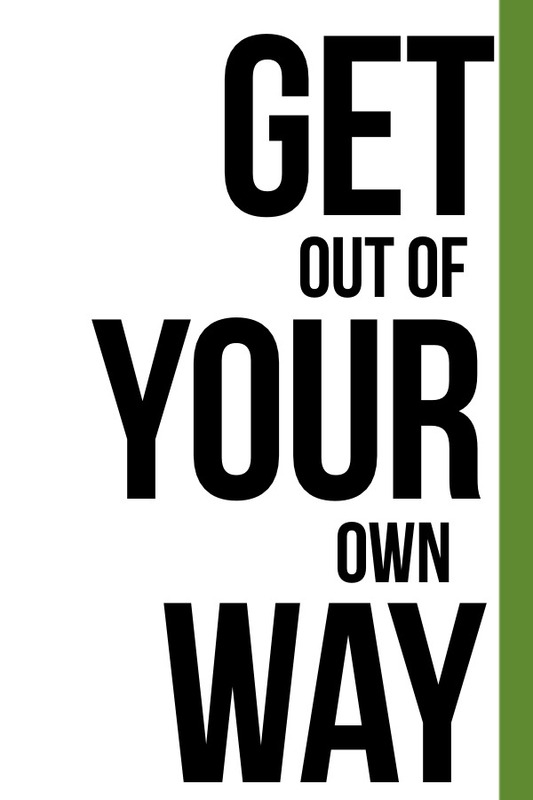 I sat at the dinner table beating myself up. How could I have put something out that didn’t taste good?!? Why am I letting people suffer and eat this crap? Because we all make mistakes in the kitchen!! I’ve made a lot in the past and continue to make them! If I threw in the towel, I wouldn’t be able to keep posting on this here site. I don’t give up because I love the feeling of accomplishing something tasty & wonderful. I keep trying and as a result I get better! My mistake was NOT tasting my ingredients beforehand. I could have substituted slivered almonds or toasted walnuts in the recipe to replace the bunk pine nuts. God knows I have enough in my pantry! 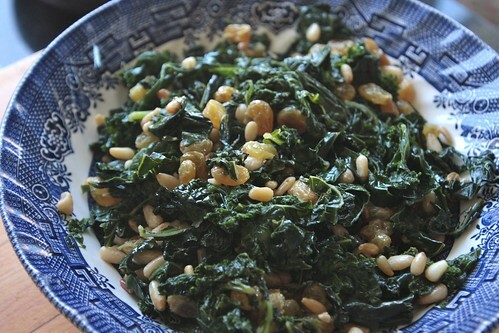 The next time I made this dish, I used fresh pine nuts with the suggested amount and LOVED it. All those feelings of disappointment were abolished. Crappy pine nuts? What crappy pine nuts? Nuts go bad! I gotta remember that. Apparently pistachios have a really short shelf life too. 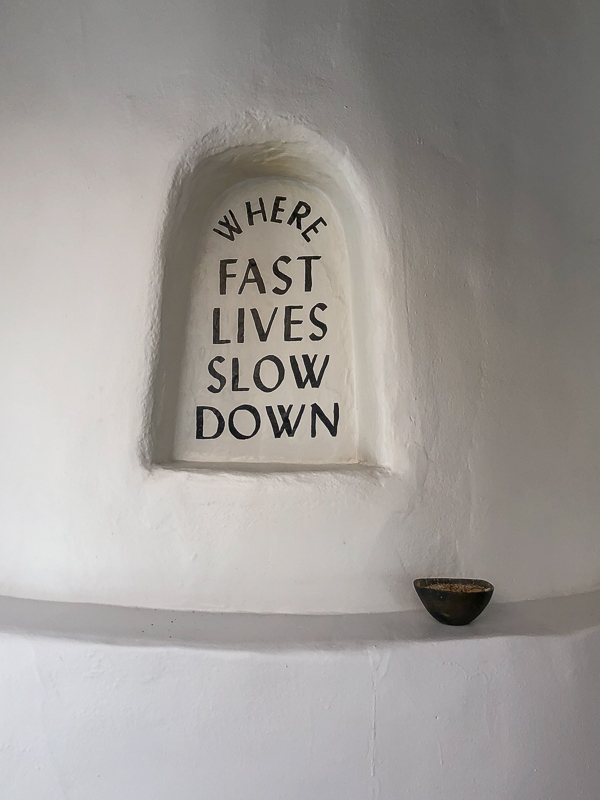 Watch out for that. 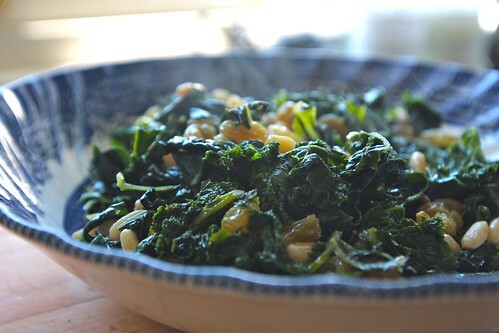 I love the balance between the bitterness of the kale & the juicy plump sweet golden raisins with the subtle crunch of the toasted pine nuts. 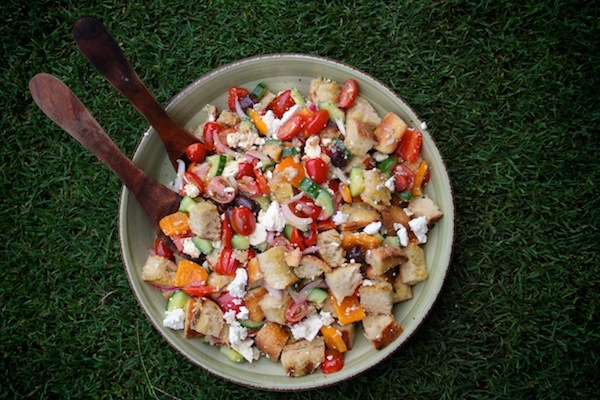 I daydream of adding a poached egg up top or mixing it with some couscous & throwing a bunch of feta on top. How about taking some leftovers and sprinkling it on top of your pizza with fresh mozzarella and sharp Pecorino before you toss it in the oven? 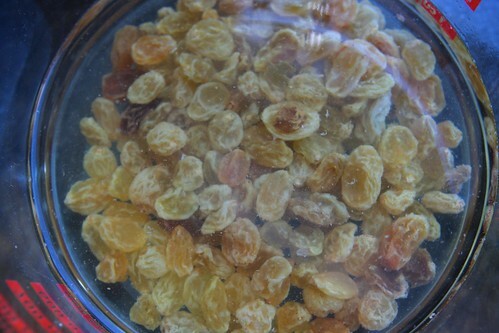 The golden raisins take a little soak in a warm sauna. Hot tub time machine?!! Toast your pine nuts. Make sure they are fresh. This is waaaaay more than 2 tablespoons. Not only did I overdo it, I overdid it with crappy pine nuts. 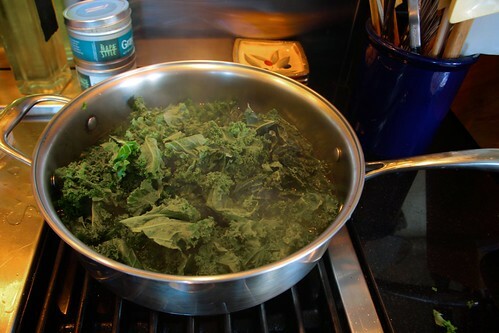 Cook your kale in boiling water. Toss it in a colander and rinse with cold water. DRAIN. Saute the garlic in a pan. 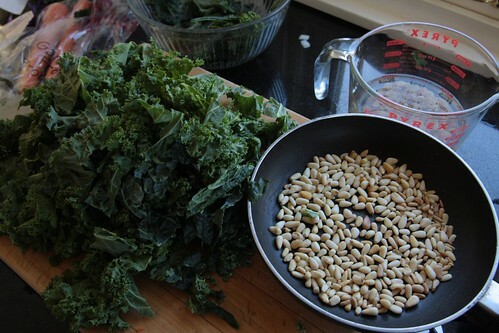 Toss in your kale, raisins & pine nuts. Stir. Top with a little aged balsamic. A simple & tasty side dish. Fill a sink with cold water. 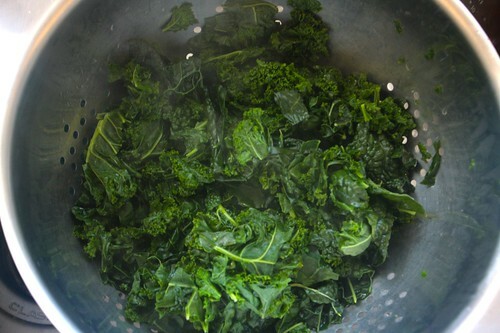 Remove the ribs from the kale leaves and swish the greens in the water to dislodge any dirt, then life them into a sieve or colander to drain. Bring a large pot of salted water to a boil over high heat. Add the kale and cook until tender, about 5 minutes. Drain in a colander and immediate run under cold water to stop the cooking. Drain again and squeeze to remove excess water. Chop coarsely. Heat the olive oil in a large skillet over moderate heat. Add the garlic and saute until fragrant and lightly colored, about 1 minute. 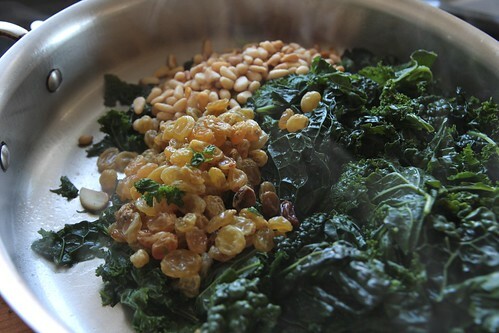 Add the kale, pine nuts, and raisins and season with salt. Drizzle your aged balsamic on top and cook, stirring until all the ingredients are well mixed and the kale is eventually coated with oil and hot throughout. Serve immediately. I love the raisins in there! Great recipe! These are all flavors we love and use often. Definitely need to put them together soon. Oh ma gaw. I love kale. 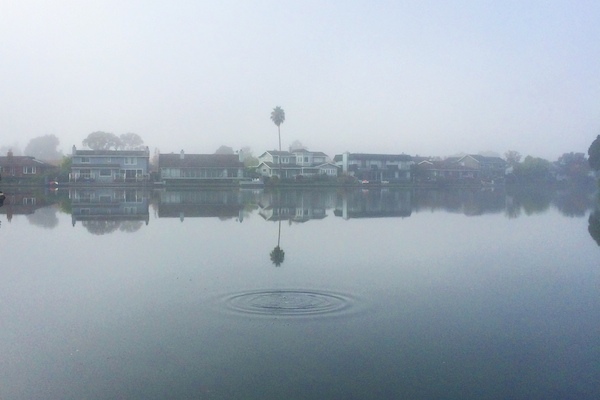 And this blog. Hugs all around! I like the sound of this, even with the raisins, which I’m not a fan of on a normal day. I think the fact that you used golden raisins won me over. I like kale and would like to try this. I’m thinking of using dried cranberries instead – what do ya think? ooo- I like the idea of cranberries Michelle had. Great names think alike, lol. As usual, you inspired me to make something out of my box. Woo-hoo to you and a happy Halloween! I keep my oily nuts in the freezer. I even pull my pine nuts directly from the freezer to the pan for toasting, without a problem! 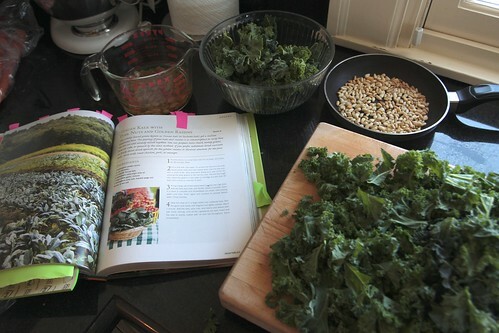 Kale is my favorite, and so is your blog, Happy November! 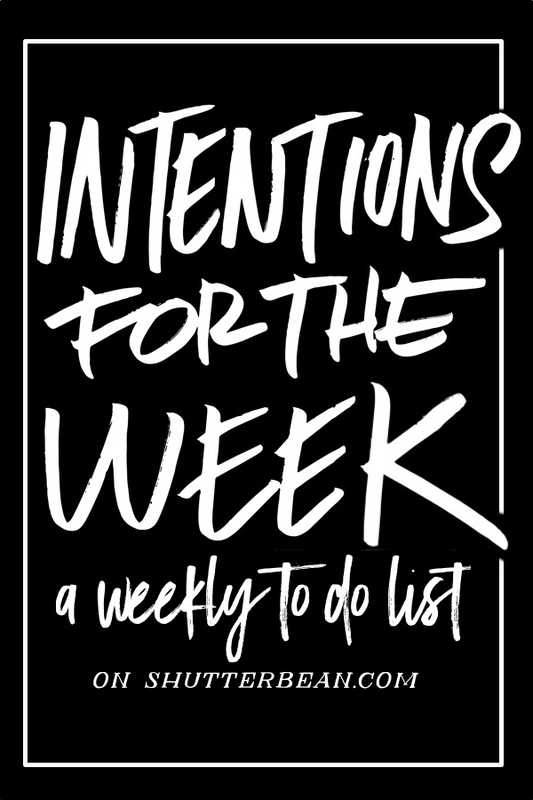 I might do that….once I have room in my freezer!! 😉 thanks Ashlee! hi Tracy! I really like your blog! 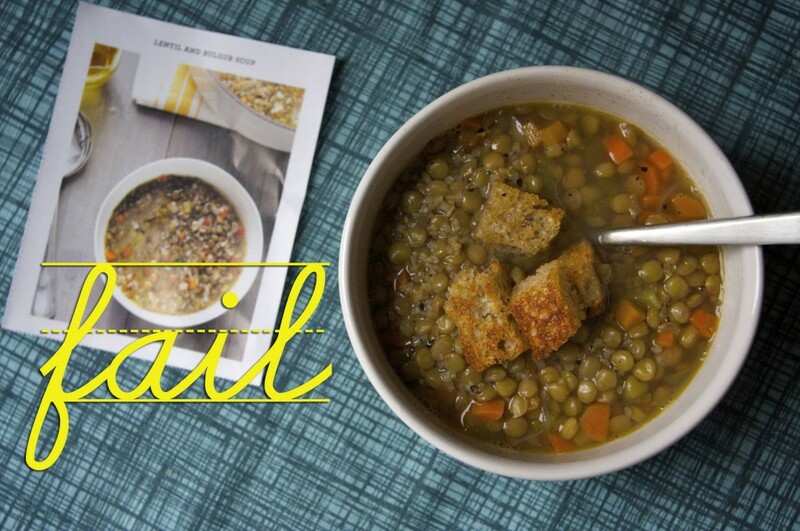 I’m testing this out and I have a question — if I made this in advance do you think it would taste the same reheated? Should be good. The raisins will be more plump and the nuts will be softer. No bigs! Seven plus years after your original posting, I found this recipe. Yum! 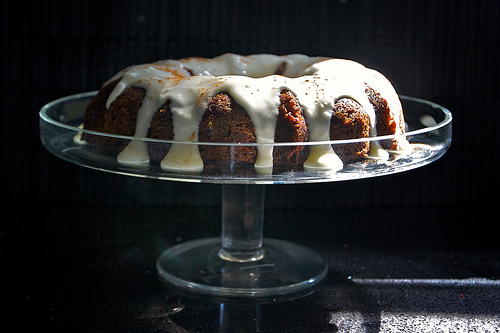 I topped with pomegranate molasses as a variation, because I had it. 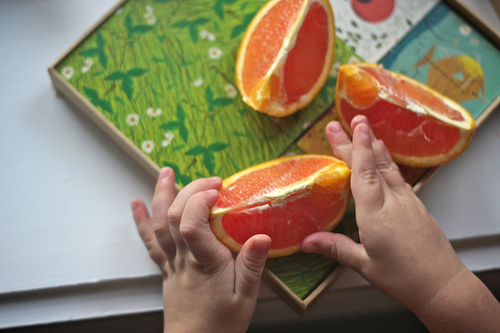 So tasty, simple to make, and healthful! Loved it!! !